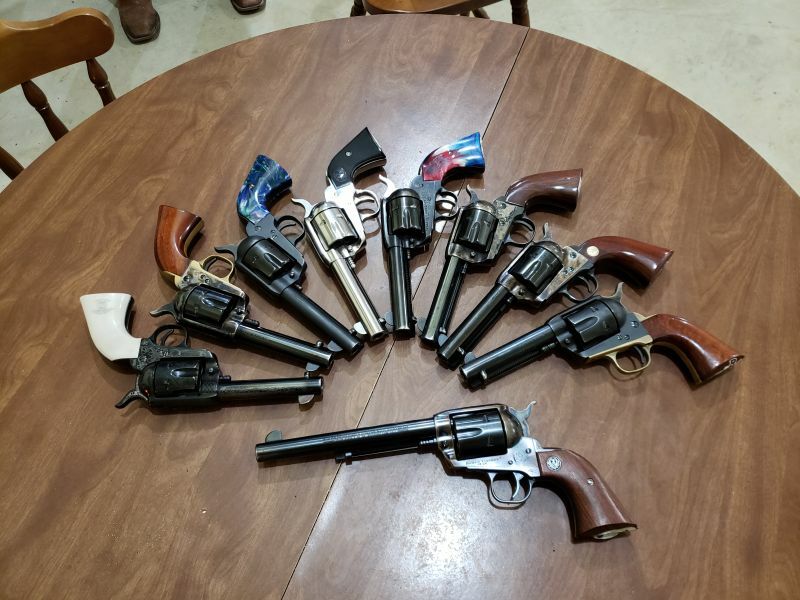 We hosted the cub yesterday as we do ever other Saturday, and after the practice was over, youngest son asked how many guns we use for CFFA shooting. I told him that honestly, I hand't counted in a several months, but I haven't bought any guns in the past year.So, we drug them out for inventory purposes. These are used solely for CFDA shooting. They are all in .45 Cot, used exclusively with wax bullet ammunition. While I own other single action revolvers in other calibers, Belle and I decided when we started that we would never own, any standard ammunition in .45 Colt, specifically because we don't want any accidents. If anyone family or friend wants to shoot a heavy revolver, we'll find a suitable range and drag out the .44s, but in this caliber, it's wax bullet ammo ony. Having said that, here are the family's competition guns, currently in use. This represents a range of guns commonly seen on any CFDA range nationwide, and there is something there to suit anyone. We tell new shooters to find a club ad try as many guns as they possibly can before they make a decision on a specific model. Belle has tiny hands, I have larger hands, and minuscule differences in frame size and grip size have a huge effect on how a gun fels ad performs in competition. We let anyone try any of our guns before they make up their minds to buy a specific model, and we're fortunate that we can have the different models that we have.